You wanted the best? It took a while, but you got the best: Forty years after the release of their debut album, Kiss have finally made the cover of Rolling Stone. 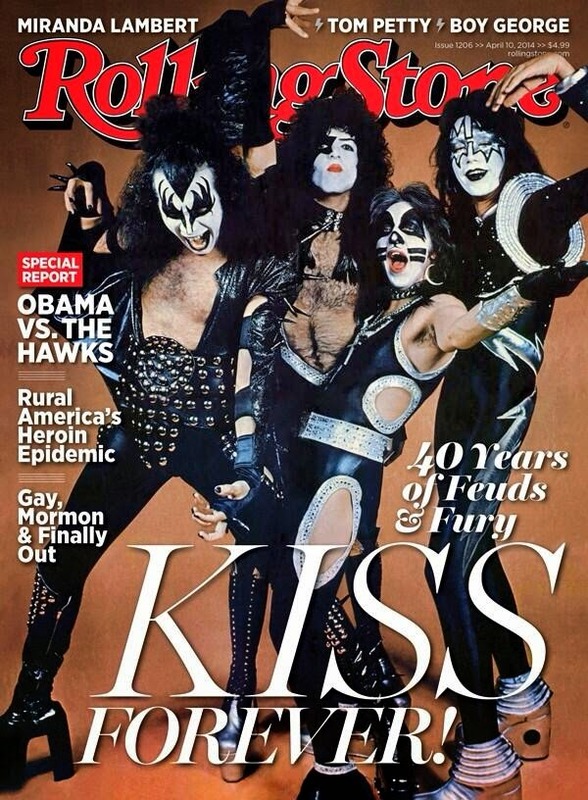 Marking the band's upcoming induction into the Rock and Roll Hall of Fame, the cover image is a classic 1975 photo of the band's original lineup: Paul Stanley and Gene Simmons, plus Ace Frehley and Peter Criss, who were both gone from the band by the early Eighties. The cover story, by Rolling Stone senior writer Brian Hiatt, tells the sad, hilarious and triumphant story of one of the biggest rock bands ever, taking an in-depth look at the founding members' lives and careers. Hiatt hung out with all four original members in their homes (in San Diego, Beverly Hills and Monmouth County, New Jersey) where they shared fond memories and, inevitably, some intense backbiting. "I keep thinking about Ace and Peter," Simmons admits. “"What are they doing now? Where are they?’ It’s gotta be close to the end. How do you make any money? How do you pay your bills?" Even Stanley and Simmons have had their differences. "We've always seen each other as brothers," says Stanley. "What we seem to be at odds at is how you treat your brother. Gene’s priority, by far, has always been himself. And he’s not one to let anyone else’s feelings or contributions get in the way." They also explain precisely why they won't be reuniting for a performance at the Hall of Fame induction ceremony. Stanley and Simmons offered to allow the former members to jam with Kiss' current lineup, featuring guitarist Tommy Thayer and drummer Eric Singer, but Ace and Peter found that proposition deeply insulting. "I won’t be disrespected," Criss says. "How can you put me in the Hall of Fame and then tell me to go sit over there in the corner while another guy puts on my makeup and plays? That’s an injustice. To the fans, too." Simmons counters that Frehley and Criss "no longer deserve to wear the paint." "The makeup is earned," he adds. "Just being there at the beginning is not enough… And if you blow it for yourself, it's your fault. You can’t blame your band members. 'Oh, look what happened to me. Oh, poor me.' Look at my little violin. I have no sympathy." Frehley suggests another reason for the current members' reluctance: "The reason they don’t want to perform with me and Peter is because the last time they did, they had to do a reunion tour. We play three songs, the fans go crazy. They don't want to open up a can of worms." Frehley, meanwhile, says he licensed – rather than sold ­– the rights to his Spaceman makeup to the band, and suggests that he’s due to get the rights back sometime soon. Also in the story, Simmons says his touring days are almost be done. "I’m 64 now," he says. "Three more tours. Two, if I have a life change of some kind." For much more on Kiss, check out the cover story, on sale Friday, March 28th — and online tomorrow, March 26th.